*Free mid-size car while cars are available. Not valid with any other special offers. The car can be upgraded for a minimal fee, unlimited mileage and taxes included, and is picked-up and dropped off at the airport. Say aloha to Makahuena 5201, the perfect oceanfront getaway. Just a ten-minute walk from some of Poipu's finest beaches, this home also has access to a pool, hot tub, and tennis courts. The Makahuena complex features a covered barbecue area so you can enjoy all your meals in the Hawaiian sunshine. Makahuena is located on the southernmost point of Kauai and 5201 is right there on the point. You have an ocean front view of the Poipu Coastline from almost every room in the condo. Incredible ocean views are the dominant feature of this resort which offers its guests a spacious swimming pool and sundeck, spa, tennis court, and more. When you're ready to come inside, the spacious living room has a beautiful ocean view from the lanai, a large flat-screen TV, and comfortable seating for 7. The open-concept kitchen is the perfect place to make your family's meals, and the dining area seats 6. One of the best views in Poipu, you will see the sunrise and the sunset most of the year. 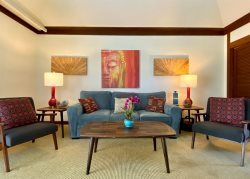 This spacious condo is on one floor with two bedrooms, two baths, open living room, dining room and kitchen with a wrap-around lanai with plenty of sitting areas. Spectacular Views: The home has a spacious wrap-around lanai with incredible views of the ocean all year. Whale Watching: From November to March, whale season in Hawaii, you can often spot migrating whales right from the lanai. For a closer view, you can try sea kayaking or a sail excursion, too! Built for Beach Bums: Makahuena is a 15-minute walk to Shipwreck's beach, the perfect place to watch the sunrise. In the evening, head to Poipu Beach, just a ten-minute walk from the house, to admire the sunset. Wake up early and watch the sunrise at Shipwreck’s Beach, then make your way to Grand Hyatt Kauai – each is just a 15-minute walk away – to choose your own adventure. The Grand Hyatt offers wonderful shopping and an authentic luau on Thursdays and Sundays. Whether it’s teeing off on an 18-hole Robert Trent Jones Jr. golf course, hiking or zip lining through Kauai’s lush landscape or getting up close and personal with sea creatures during an afternoon of scuba diving, you’ll have no problem finding an experience that’s worth writing home about. And when you’ve worked up an appetite, walk 10 minutes to Brennecke’s Beach Broiler for pupu platters, ahi tuna burgers and more with a vista view. Starter kit of paper and cleaning supplies provided such as paper towels, toilet paper, laundry detergent, etc.